Industry standard 5/8" x 11" mounting threads. 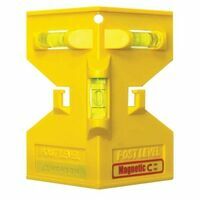 Use as a lightweight, yet sturdy, base for your laser level. Hollow for optical and laser plummet instruments, flat head design makes setup fast, plumb bob hook, Quick clamp, and hinge stops. Electrostatically powder painted castings for a durable and long-lasting finish. Extension legs adjust quickly and securely, 63"H open, 38"H closed. Heavy-duty poly-webbing shoulder strap. Projects two lines making a cross-line projection for a wide array of level and align uses; with top-notch accuracy and one-switch operation, the user's leveling and alignment tasks are done quickly and correctly; the laser lines are visible up to 30'; the Smart Pendulum system self-levels and indicates out-of-level condition to help ensure an accurate layout and it locks the lines at any angle; the pendulum system locks when switched off, to assure secure tool transport; includes (1) MM 2 Flexible Mounting Device and (2) AA batteries. Two tools in one to simplify hanging and mounting projects. Levels automatically for precise results. Projects horizontal level line. Stud sensor detects wood and metal studs plus live A/C wires. Includes: protective storage case and batteries. Dual-sided LED indicator - for easy visual readout on both sides of the receiver; quick-release mounting bracket - makes receiver easy to position, attaches on leveling rod; adjustable audio - gives clear signal of on-grade positioning, adjusts to worksite noise levels; extends working range - detects lines from Bosch GCL 2-160 up to 165 ft. in outdoor conditions and when there is no surface to see the beam on; heavy-duty magnets - for secure attachment to metal surfaces; robust IP54 over-molded construction - ensures splash water/dust protection for dependable operation. Includes: (1) Quick-release mounting bracket and (2) AAA batteries. Projects bright, crossing horizontal and vertical lines for various leveling and layout applications; 40 ft. range and accurate up to +/- 1/4"; self-leveling dual axis lines; locking pendulum housing for durability with internal parts; over-molded housing for maximum shock resistance; integrated 1/4" thread for use with a tripod; includes: 40 ft. Cross-line Laser and (2) AA Alkaline batteries. Highly visible plumb point projection for leveling, plumbing up and other layout and alignment tasks. Integrated reference lines, built in magnets, ergonomic over-molded housing, easy access battery compartment, snd automatic out-of-level sensing. Over-the-track application design. Specs: accuracy up to plus/minus 1/8" at 50' (plumb up) or up to plus/minus 1/4" at 10' (plumb down). laser diode class IIM 650nm, less than or equal to 1 mW. self leveling up to 5 degrees, mount threading 1/4-20, operating temperature: 32 degrees F/0 degrees C-104 degrees F/40 degree C, range up to 30-ft, weighs 1.2 lbs. Includes: (1) belt pouch. Features three bright, self-leveling beams which provide accurate plumb and horizontal point transfer. Intended for indoor use, the rugged overmolded housing on this level provides protection in case of drops or run-ins with other tools. The handy leveling instrument is accurate to 1/8" with a range of 100 ft. Interior horizontal and vertical layout; locking mechanism protects inner pendulum during transportation; 360 degree graduated base allows angle layout; emits cross line lasers; kit includes laser, tinted glasses, elevating tripod, instruction manual and hard-shell carrying case. Unit points up/down and front for plumb, align and level; one-person does the job of two people using manual plumb bob; multi-purpose mounting attachment allows unit to be used virtually anywhere; integrated reference lines - for precise positioning of tool and transfer of points. Features vertical, horizontal and cross-line modes and can project two lines independently or together for a broad array of alignment and leveling applications; includes the Bosch-exclusive "VisiMax" technology, which allows for outstanding line visibility in standard working conditions; the laser lines are visible up to 50' with an accuracy of +/- 1/8" at 33'; the Bosch smart pendulum system self-levels and indicates out-of-level condition to help ensure an accurate layout and it locks the pendulum after the laser is switched off for secure transport; includes: (1) magnetic mounting bracket, (1) laser targer plate, (3) AA batteries and (1) hard carry case. Dual-sided LCD display for easy visual readout on both sides of receiver; Indicator lights and audible detection signal on/off for ease of use in various jobsite conditions; built-in heavy duty magnets for secure attachment to metal surfaces; ideal for suspended ceiling installations; simple and secure assembly of leveling rod with mounting bracket for quick and accurate leveling applications; measures up to 165'. Projects 90 degree lines for squaring, with laser lines positioned in front of laser base for easy centering over point and precise adjustment. Bright highly visible laser lines raise from the surface to project over uneven surfaces and are clear, sharp and very precise for all tile and wall/floor cover surfaces. Water and dustproof to ensure years of dependable operation (certified at IP54). Strong magnets on bottom of tool provide secure attachment on positioning plate and other ferrous metal surfaces.